This morning on the 9am trip we headed out to the area just south of the shipping lanes that the whales have been hanging out in for the past couple of days. Being the first boat out in the morning it is our job to find the whales for everyone else! Luckily our captain quickly spotted a blow up ahead of us and it turned out to be three humpback whales feeding in the area. We managed to get great looks at two, Measles and Mogul but the third whale was just too far away to figure out who it was. Both whales were doing some subsurface feeding using large bubble clouds to concentrate the fish into a bait ball for easy consumption. Mogul even gave us some great close looks surfacing right off our stern! 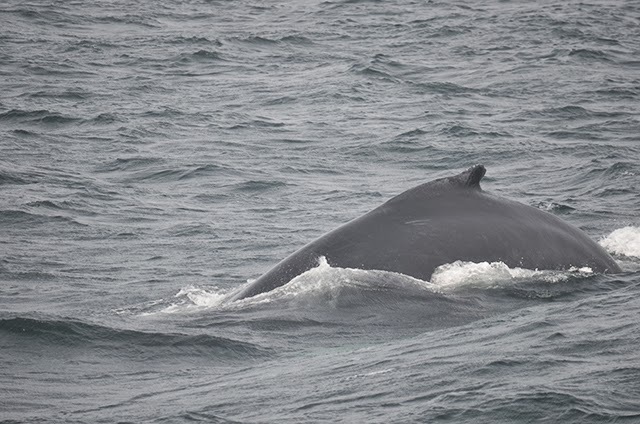 This afternoon on the 1:30 trip on board the Cetacea we headed out to the same area that the whales have been seen all week and earlier in the day as well. The winds picked up this afternoon and started some large swells which made spotting the whales much more difficult. 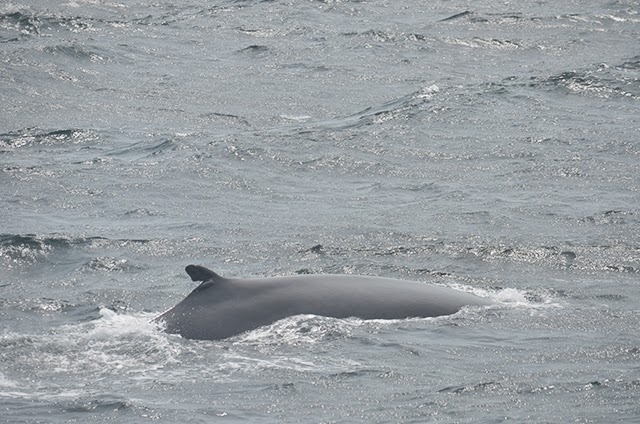 Early in the trip we spotted a fin whale which was very difficult to see in the troughs of the waves but the photos do show that it was a large scar in its dorsal fin so likely an animal that is easily identified. We carried on to find the humpback whales and found Mogul again. He didn’t seem to be doing a huge amount of feeding on this trip and was taking short dives and only spending less than a minute at the surface each time. 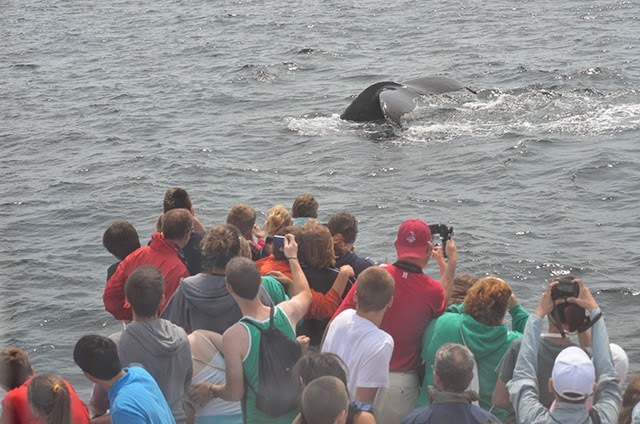 None the less we got some great looks at this whale. 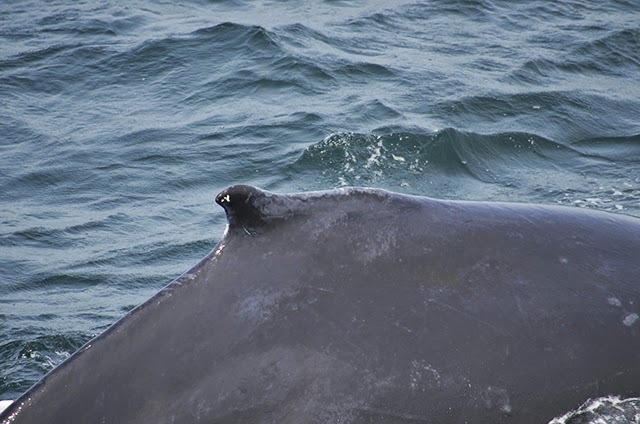 On today’s 10am whale watch aboard the Asteria, we headed the middle of Stellwagen Bank, in the midst of the Boston shipping lane. We didn’t see any ships pass through today, but as we passed by the Conley Container Terminal during our harbor portion of the trip, it was a good reference point of how we interact in the same environment of the whales. 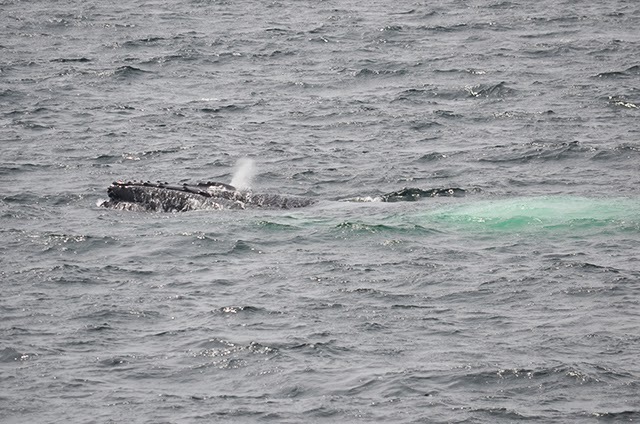 Today we found three humpbacks scattered in the area, and were able to get close looks of two of the individuals. We first spend time today with Measles, who was taking quick dives and surfacings as it bubble-cloud fed consistently. At once surfacing, Measles popped up next to us to form a big bubble cloud! 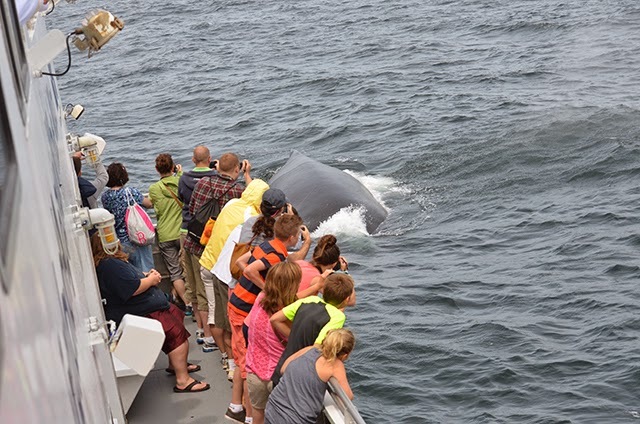 Passengers got great up-close looks at this whale. Measles began to be a bit more sporadic, so we then spent time with Mogul, who was also bubble cloud feeding. Today we headed out to the middle of Stellwagen Bank in search of whales. 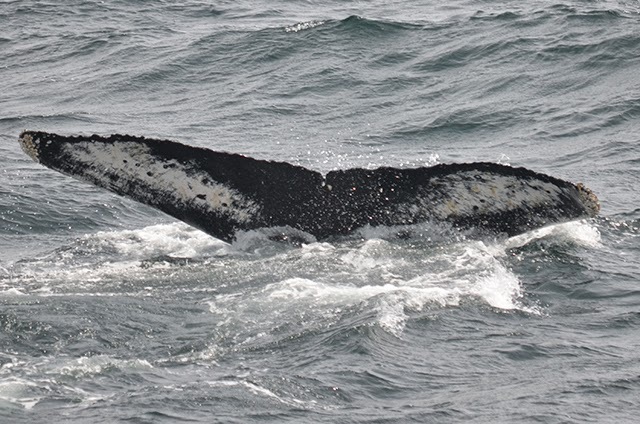 We ended up right in the middle of the shipping lane where we found Measles, a humpback whale born in 2002. 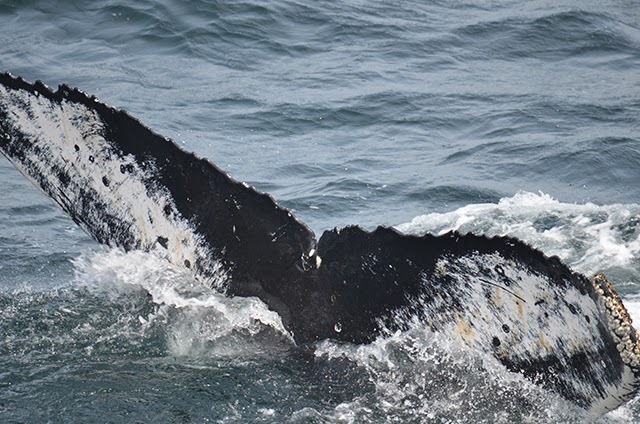 Even though data taken from whale watch boats was used to shift the shipping lane to areas where whales are less frequently spotted a few years ago, we still sometimes have sightings in or near the shipping lane. When we first spotted Measles’ blow in the distance, we were surprised by a full breach and then a chin slap! Unfortunately we were about a half mile away at this point, but it was an exciting way to start off the trip. 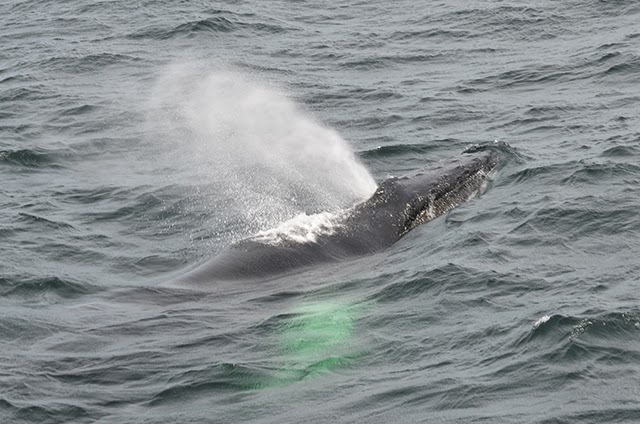 We made our way over to where the whale dove down and could see the remaining green bubbles from the exciting surface activity we witnessed from afar. Measles took 2-4 minute dives and was bubble cloud feeding throughout the trip. It was a very blustery day on the water which was a nice break from the muggy and hot day in downtown Boston.